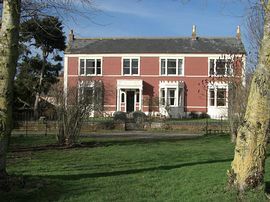 Model Farm is a country house consisting of an impressive Victorian front and a 17th century farmhouse behind. 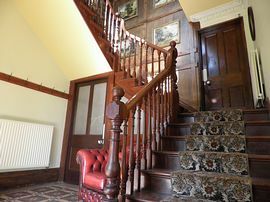 The self catering apartment is in the Victorian building and retains many of the original features such as: high moulded ceilings, wooden floors and working fireplaces. All bedrooms have en-suite facilities. The apartment is south facing giving plenty of light all day. Situated in the hamlet of Perry Green, only 8 minutes away by car from Bridgwater, yet in the peace and quiet of the country, Model Farm is just the place to unwind and relax. Superb views of the Quantocks from the garden. The pretty village of Cannington is close by, with an interesting 20 minute walk by footpaths over fields. Junctions 23 and 24 of the M5 are only 5 miles away giving swift links to all areas. 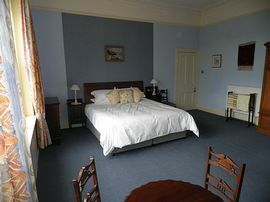 The apartment has 3 large bedrooms, which sleep 6 (or 8 using 2 extra singles, which can be placed at your direction). 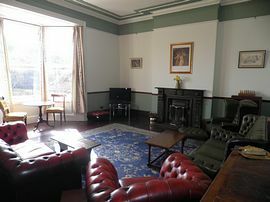 In the lounge there is plenty of comfy seating on leather chesterfields, with an open fire. Provided is digital TV and DVD, plus a selection of DVDs, games and books. There is free wireless broadband available. 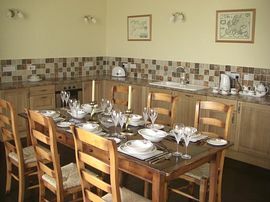 The kitchen diner is modern, fitted this year and fully equipped with a microwave, cooker, hob, fridge, freezer, dishwasher and ironing facilities . There is a large refectory type table, which will comfortably seat 8. Outside, the apartment has sole access to the front garden with lawns and flower beds. There is ample garden furniture and a paved barbecue area. You are also welcome to stroll around the 4 acres of grounds to the front of the house where we intend to create a garden. Parking is at the front of the house with plenty of space. Fine Victorian building with period furniture. 4 acres of grounds with views of the Quantocks. Private garden, table and chairs, barbeque. Views of Quantock hills and 4 acre garden. Local Services: Wembdon and Cannington villages with local shops, pubs and churches nearby. From M5 (J23 or J24) follow A38 into Bridgwater. Follow sign A39 Minehead ( ignore first sign to Wembdon). After leaving Bridgwater continue for approximately 1 mile, pass the Pace Garage on the right. Go down the hill and at the double bend turn right sign posted Wembdon. Turn immediately left sign posted Perry Green and Chilton Trinity. After approximately three quarters of a mile you come to a T-junction, follow sign no through road. Model Farm is the second building on the left. From: £450.00 to £850.00 per week for 6 people, plus an additional 10% per person for up to 2 extra people. Open from April until Early November, Saturday to Saturday.